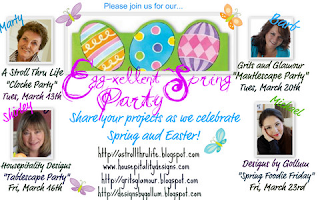 Today is the second event of the wonderful Egg-xellent Spring Party and I am joining Shirley at Housepitality Designs for a Spring Tablescape party. Be sure to visit her and see all the lovely tablescapes everyone is creating for Spring. I thought I would do a white tablescape for Spring. So fresh and clean. I pulled out all of my white accessories to create an all white centerpiece. 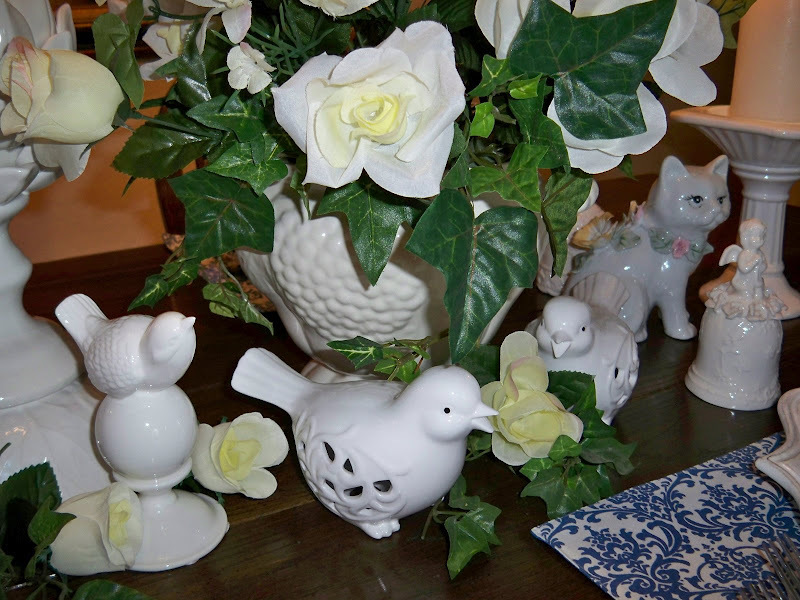 Southern ladies, bird candleholders, bird figurines of all sizes, bells and a white artichoke pedestal. I am using some simple blue and white placemats and napkins, white charger and the famous Big Lots dishes. 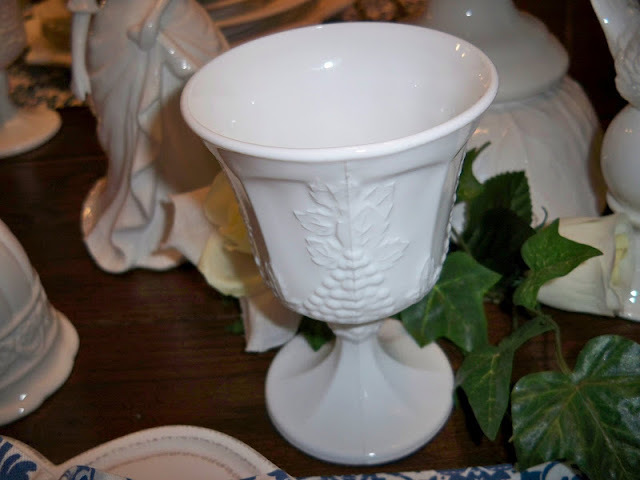 The white goblets I found at GW a few years ago. A little candlelight for a romantic glow. Thanks so much for stopping by, now head on over to Shirley's and see what everyone has created. Oh my gosh Marty, your whites are so beautiful - just so classic. I love the blue with it. I always get so much inspiration from your posts. Thanks so much. I'm going to post my second tablescape tomorrow which is for St. Pats Day. I have a long long way to go, but at least I'm having fun. Very very beautiful! Love white. Oh Marty, I just LOVE all your blue and white! I love this table. The contrast of the white and blue are awesome. OMG I love it Marty! Blue and white...my favorite combo...those place-mats and napkins...so pretty! Love the blue and white fabric and white accessories! I love the combination of blue and white, Marty. SO pretty on your tables. Marty, this is a lovely tablescape. The blue & white are beautiful! Such a classic look to your table, Marty! I love the blue and white. Those artichokes are neat pieces and I love them in your tablescape. Such pretty white pieces! Looks great with the blue. Marty, I love the table. I will be posting mine later. Marty what a gorgeous table. I love daisys with blue and white. Marty your table is so lovely! Those linens are the prettiest blue and white I have ever seen. Amazing what style and design can be added with fabulous linens. I just love white dishes too, they are sooo versatile! Your table looks gorgeous! You have that special touch. A very pretty table Marty! I love the linens and the charger plates are wonderful! 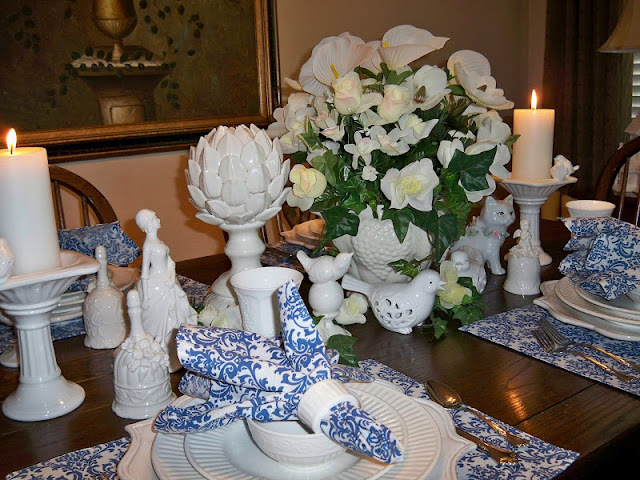 Marty...your table of blue and white is just so beautifully done. 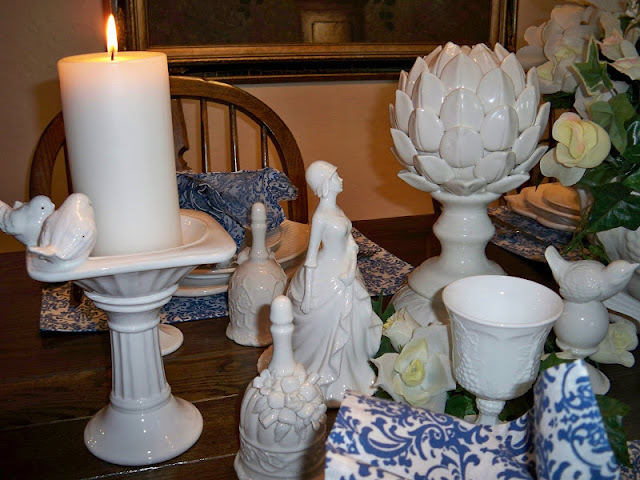 I love how you gathered the white ceramic and porcelain pieces to make such a fantastic vignette. Each piece so compliments one another....Such a clean, crisp appearance of a wonderful Spring table! !..Love it all! Such a pretty table setting. 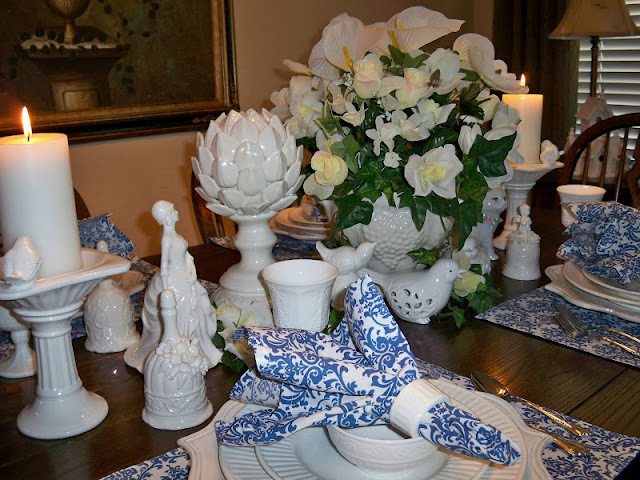 One of the prettiest combinations in my opinion is blue and white, and you have so many wonderful white accessories. Looks lovely, Marty! The blue and white are gorgeous. LOVING the blue/white setting. Those lil birds are gorgeous! 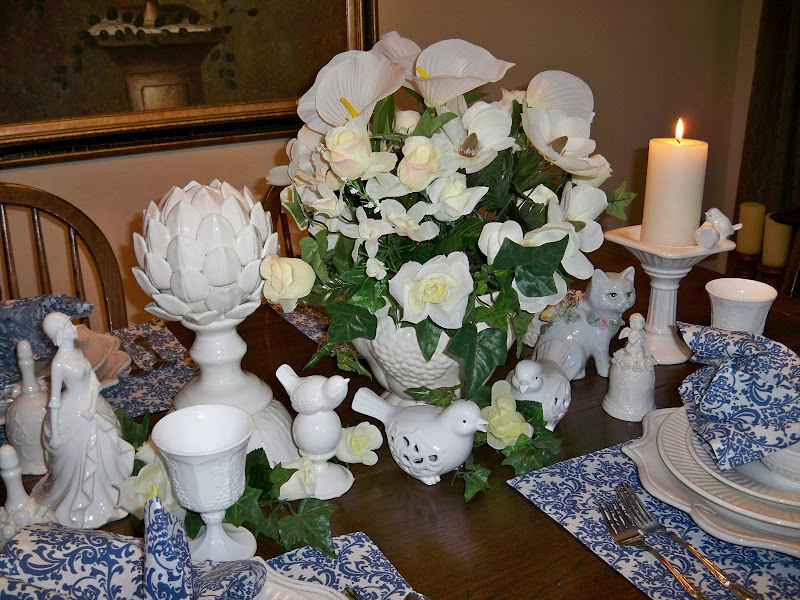 Your white Spring tablescape is just lovely. Love all the white, especially all the sweet little birdies. And the pop of blue color is beautiful. Love it. The whites are beautiful and made doubly so against that blue and white. I really love the look of this. Marty, this is a beautiful tablescape. U love the white goblets. The blue & white together look amazing! I love all that blue and white! It's so fresh for Spring. 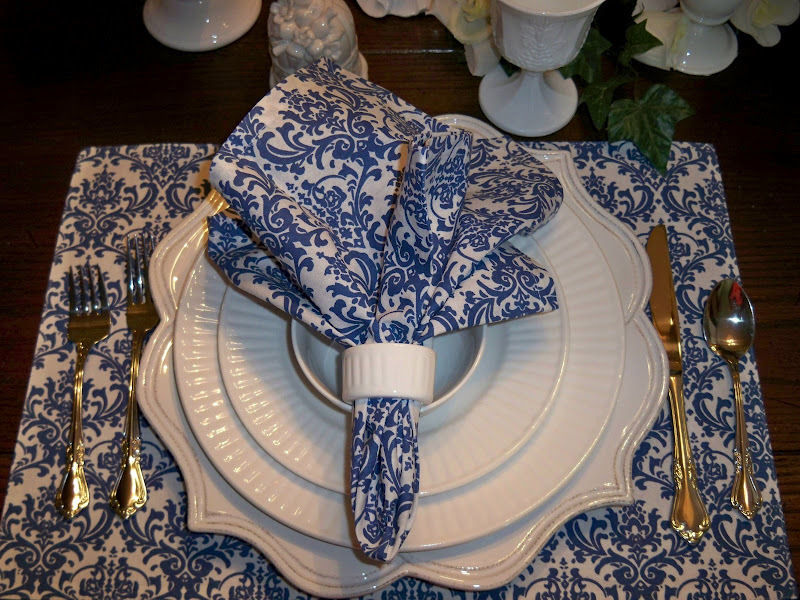 Love, love, love your blue and white napkins and placemats! They are so pretty! Have a great weekend! A beautiful tablescape, Marty! I especially love the all-white accessories with the only color coming from the blue and white linens. So crisp and pretty. I LOVE blue and white! Can't go wrong with blue and white. Very pretty placemats and napkins combined with all your white.